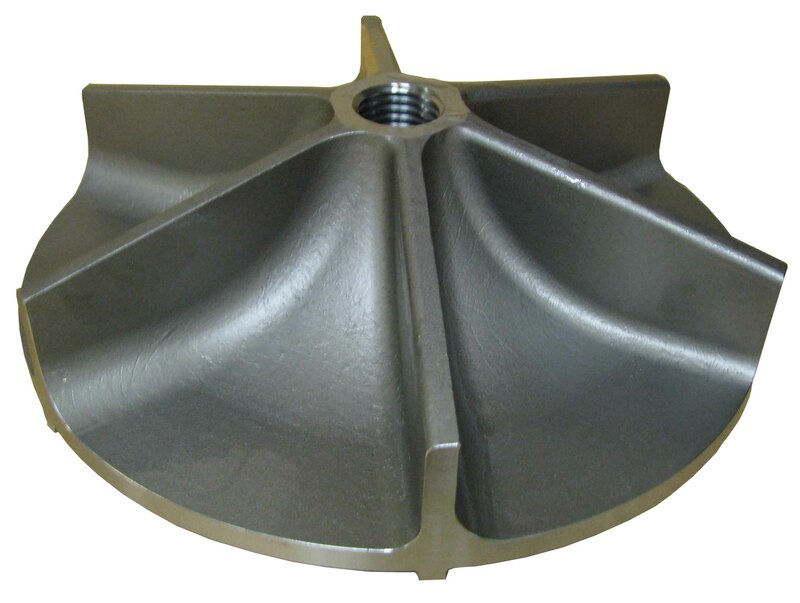 Vortex Impeller Pumps Solve Solids Handling Challenges. Think about how effective the average toilet is…It creates a vortex action using water flow and pressure to quickly and efficiently dispose of human waste, sanitary products and the occasional dead goldfish. 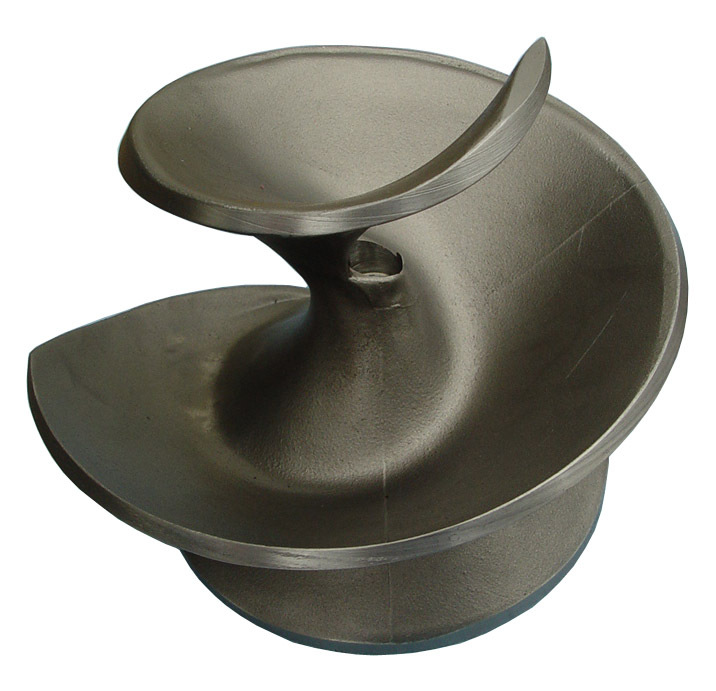 The vortex energy found in the common toilet is the same kind of energy which makes our vortex impeller pumps perfect for handling stringy materials, rags, slurry and many types of solids and semi-solids. Consider also, that engine driven hydraulics powering a motor atop our submersible pumps magnify this vortex effect, creating an even more effective pumping system. Using any vortex type impeller submersible pump will help eliminate the clogging which sometimes occurs in channel impeller pumps. In addition our vortex pumps do well when pumping sludge, sewage, silt and even the occasional goldfish. Why use open center pump circuits? A popular question we are asked is “Why do you need to use an open center hydraulic circuit when driving a submersible pump?” The quick answer is to keep the pump from coming to an abrupt sudden stop. Let’s think of it in terms of driving a car. You are driving your car and the traffic light turns yellow and then red. You apply the brakes just enough to slow the car to a stop. Imagine what it would be like if you had to slam on the brakes or jam the transmission into ‘Park’ every time you needed to stop. Both you and the car would experience excessive wear and tear. A closed center hydraulic system acts the same way when driving anything with a hydraulic motor, especially driving a pump. 1.) In a closed center circuit, the valve controlling the direction of oil on the submersible is placed in the center (off) position, the oil returning from the submersible pump is blocked and has nowhere to go. 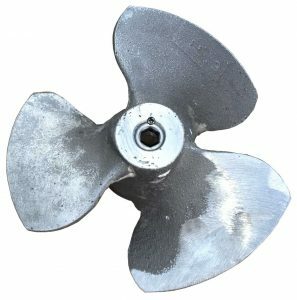 The pump impeller goes from spinning fast to an abrupt halt. This can cause damage to the pump and cause motor seal failure. 2.) In an open center circuit, the valve controlling the direction of oil on the submersible pump is allowed to pass through the valve and return to the oil reservoir and allows the pump impeller to slowly wind down. See this link for a hydraulic diagram that shows a typical open center hydraulic circuit. All of Hydra-Tech’s standard power units are single direction open center systems that provide safe hydraulic power matched to the pumps they drive. If it is impractical to change the existing hydraulic circuit on the power unit or vehicle you are using to drive a submersible pump, there is another solution. The Hydra-Tech Pump can be used between the power source and the submersible pump to prevent sudden stops, wrong rotation or over-speeding and allow you to control the pump output. Two factors must be used to determine the maximum length of hydraulic hose you can run from the hydraulic power unit to the submersible pump. On the pressure side friction losses in the hose and couplings will reduce the amount of pressure available to the hydraulic motor. This will cause a reduction in power from the motor and may have an effect on the submersible pump output. 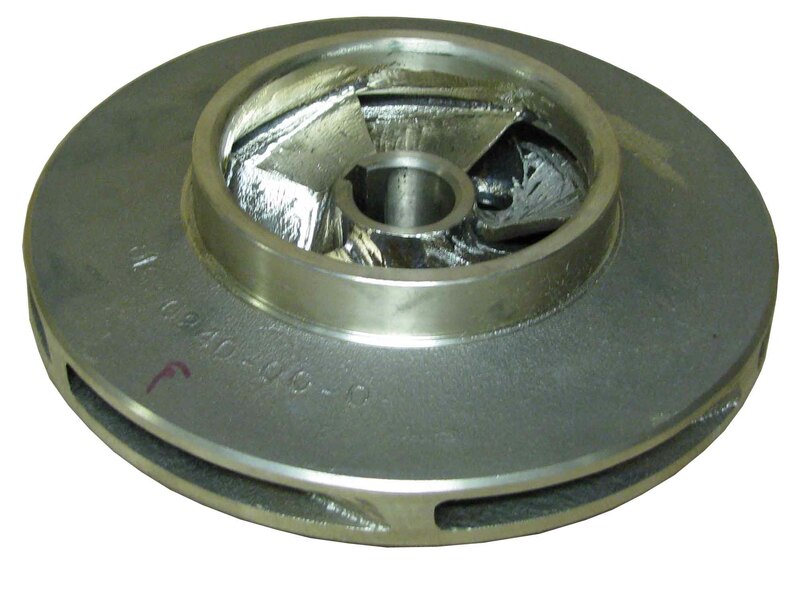 On the return side friction losses not only will effect performance but also create excess backpressure that can damage the hydraulic motor and possibly cause seal failure in the motor. As a rule of thumb we recommend going to a larger return hose on running distances greater than 150ft (45m). Use a larger hose on the pressure side on distance over 150 ft (45m). Case drain lines (third lines) are used to relieve any excess pressure build-up in the hydraulic motor casing on the submersible pump. The larger the hydraulic flow capacity of the system, the greater the need for case drain lines. All of Hydra-Tech’s power units 25HP (15GPM) and above have provisions for case drain lines to be fitted. All of Hydra-Tech’s pumps that operate with input flows over 35 GPM (132LPM) have case drain lines fitted as standard. Pumps that operate with flows from 15 to 35 GPM only require case drain lines when you are using 150 ft. (45m) or more hydraulic hose from the power unit to the pump. Units under 15 GPM (57LPM) normally do not require case drain lines and in applications over 150 ft from the power unit to the pump, a larger size return line can be used to reduce back pressure. Penny for your thought, Eh? Gas & Oil Expo, 2013 – Spent a couple days touring the Expo in Calgary Alberta. The show featured a lot of environmental services companies, several consulting and engineering firms, a good representation of construction and pre-fabbed structure companies and a large collection of safety equipment manufacturers and suppliers. On the pump side, there were several companies , but not much in the way of electric or hydraulic drive submersibles. Positive displacement pumps were well represented as were chemical injection pumps and a few centriugal pump companies. Expect to see a larger contingent of pump companies at the Oil Sands Conference this fall in Fort McMurray. The Carbon Footprint created by all pumping systems are a not so hidden cost associated with any pumping job. When comparing electric drive submersible pump systems to hydraulic drive packages, you might be surprised to learn that the overall efficiency of hydrualic drive systems means less fuel comsumption and less CO2 emissions than like-sized generator or electric grid based pumps. You can make some comparisons of your own using our independently commissioned Carbon Footprint calculator found on the landing page of our website. Vicosity and its affect on pump performance is often difficult to estimate. Since most pump curves are based on water, understanding true system outputs when pumping thicker materials tend to be based on practical experience rather than hard data. To get more accurate data, we at Hydra-Tech plan on investing significant resources to put four or more of our pumps through a weeklong series of test at a nationally recognized test facility. Following those tests, we will compare our actual results to the performance figures predicted by several of the online viscosity correction calculators….Stay tuned for more details! Elastomers and Bio-Degradable Hydraulic Oil- The environmental benefits of using zinc-free and/or other types of bio-oil are significant. There are some “no-sheen” products out there which are especially attractive for use when working in sensitive areas. Just a word of caution when selecting which oil might be best for your situation…Check the chemical compatibility of the elastomers in your O-rings and seal components; some of these bio-oils can aggressively attack certain types of seal and O-ring materials. Help! It’s broken but it can be fixed. Nothing is more aggravating than having an equipment breakdown on a job site. Even more irritating is finding out the unit can’t be repaired on-site and has to be taken back to the shop for repairs. Electric submersible pumps and electric generators are notorious for this and in most cases cannot be repaired on-site. 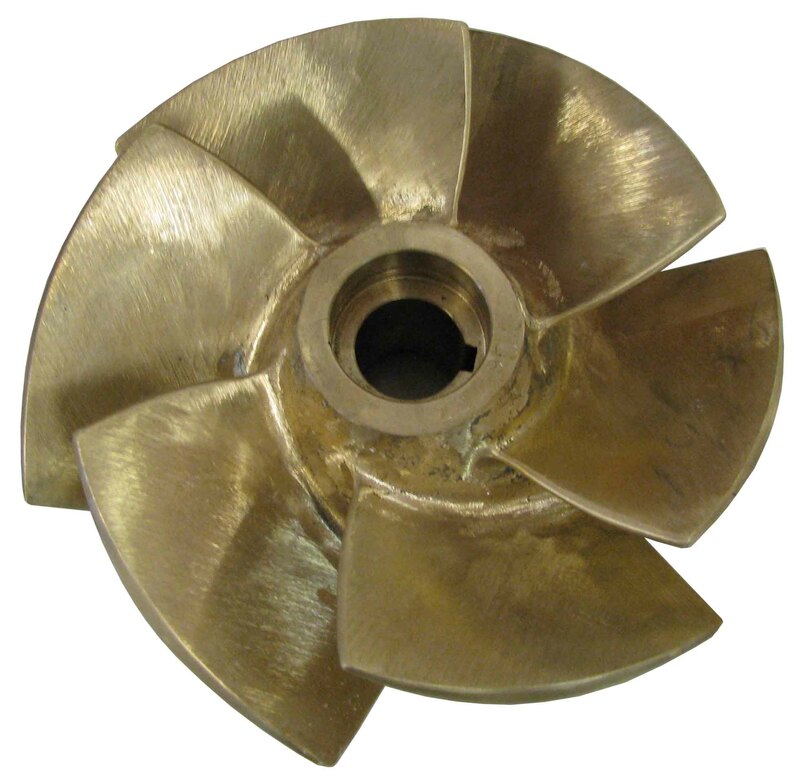 With that in mind, Hydra-Tech has engineered simplicity into pump designs that allow for field serviceable repairs. 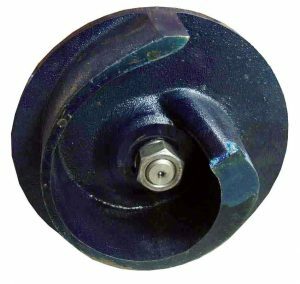 Hydraulic motors that can be changed out in minutes. Pump bodies that separate quickly with a few simple hand tools. Hydraulic hoses that are interchangeable and can be switched out easily. Easy access to service points, filters and components on power units. Customer tech support services that will help diagnose any issues that may arise and quickly determine the best way to solve them. Many times a simple fix is all that’s needed and your staff can have the unit back on-line without needing specially trained technicians. Keeping things COOL will prolong your hydraulic units life. Efficiency and Effectiveness – How watching the Pressure Gauge, Tightening connections and keeping things “cool “will prolong the life of any hydraulic system. Our engine or motor based hydraulic power units convert fossil fuels or electricity in to hydraulic flow and pressure which does the useful work of powering the rotation of the impeller in our submersible pumps or any other device fitted with a hydraulic motor. As with any energy creator, system components which don’t help with doing work, hurt by creating heat. So, to insure the most efficient use of the primary fuel, careful attention must be paid to all of the components of the hydraulic system and how each hydraulic pump, motor, valve, fitting and piece of plumbing create inefficiencies by generating heat. Once the design is done and the user puts the whole system to work, the two best ways to keep things cool are: making sure the hydraulic connections at the hoses and submersible pump are fully seated and only running the engine speed up to the point where the hydraulic system pressure shown on the pressure gauge is no longer climbing. When the pressure on the gauge stops increasing, this means that the system is doing all of the work it can do given the pumping conditions. Increasing engine rpm beyond this point does more harm than good. Specifically, running engine speed up beyond the pressure “sweet spot” does nothing for system effectiveness (no more work gets done) and wastes expensive fuel. In addition, efficiency is hurt because the excess hydraulic flow resulting from the engine mounted hydraulic pump turning faster dumps over the small orifices in the relief valve which in turn creates nothing but HEAT. This heat breaks down the hydraulic oil, creates blow by and generally does bad things to all the critical system pieces. In the end taking two simple steps, keeping your eye on the pressure gauge and making sure things are tight will always result in a more efficient and effective pumping system. Tested, approved and deployed by a purchasing arm of the military, Hydra-Tech’s HT50DQV powers submersible pumps for salvage operations and hydraulic power for dive projects. Like all Hydra-Tech sound attenuated packages, these units are perfect for residential areas and other noise sensitive locations. 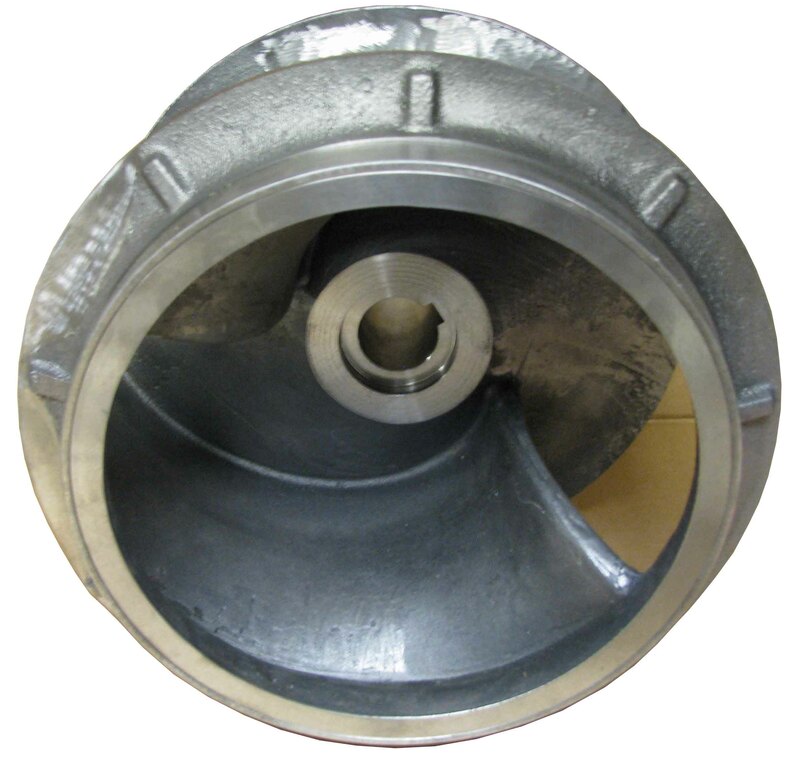 Pumps are mechanical devices used to move a liquid from one place to another. On the most basic level, without allowing for friction losses, the difference in altitude from place A to place B is called the pump head requirement. It is measured in linear units such as feet or meters. The flow of the pump is measured in volumes per unit time, such liters per minute or US gallons per minute. The pump curve shows the relationship between these two measurements. Here is an example of a curve and how to interpret it. We calculate feet of head to see how much pressure (psi=feet of head /2.31) the pump must overcome to deliver the resulting output flow at the delivery point. You will notice each line is labeled from A-D, this is showing the different hydraulic inputs needed to make the pump run at the different levels of efficiency. 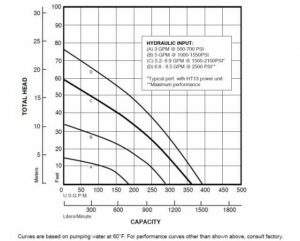 For example, in order to get your pump to pump 75 GPM @ 50 feet of head you would need a hydraulic unit able to provide 6 GPM @ 1500-2100 PSI, which you can find at Hydra-Tech Pumps with their HT13G portable hydraulic power unit. *The maximum shutoff head (where all flow stops) of this pump is 75 feet. 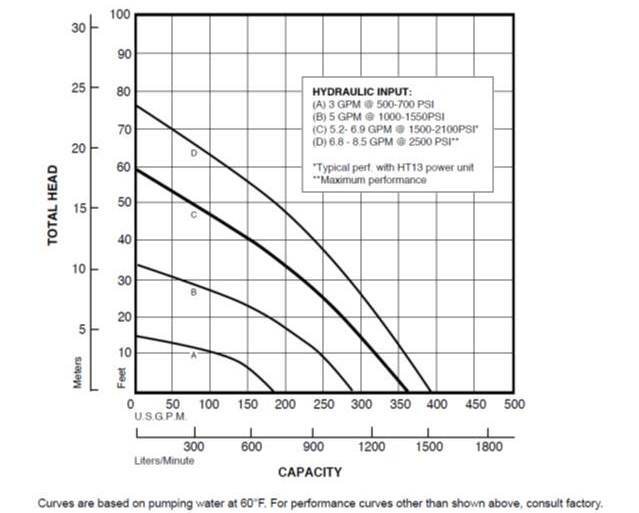 The best efficiency point of the pump would be about 85% of the maximum shutoff head. So at 64 feet the pump would be running most efficiently. Which discharge hose is right for me? Often overlooked when evaluating or calculating pump performance is the role of discharge hose. If you are using hose rather than pipe, the type of hose selected can and does have a major impact on pump output and is a common reason for pump system under-performance. When choosing a type of discharge hose, you should consider more than just the price point. Specifically, the lower cost lay flat and non-reinforced rubber hose create additional head pressure as the pumps must work against the actual head and also work to keep the discharge hose expanded while both starting and pumping. While not good for all jobs, this type of hose can be effective for lower head, short horizontal run-out applications, where there is not a lot of total head to overcome. The other thing to consider when thinking about lay flat hose is the question of durability. It is easily the most sensitive when it comes to abrasion and puncture, and in severe conditions, lay flat can quickly turn in to a sprinkler hose. 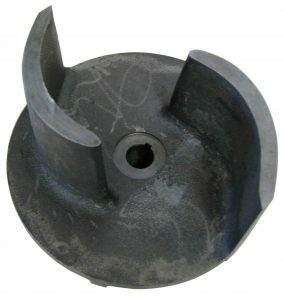 Non-reinforced rubber is much more durable than lay flat. However, with any non-reinforced hose, kinking and the resulting discharge line obstruction can often occur. As I am sure you figured out by now, either type of reinforced hose will eliminate the false head created by the collapsing hoses and as a result the impact on system performance will be minimized.. So when choosing between the reinforced rubber and wire reinforced vinyl, you should think about things like flexibility and weight. The vinyl product is almost always lighter with a better bend radius, but can also be a bit pricier than the reinforced rubber. The rubber on the other hand typically is more abrasion and puncture resistant. To sum up, the same discharge hose is not right for every job. Consider all of the job conditions and choose the hose which create the best mix of optimal system performance, durability and cost minimization. In this world where we all strive to save energy and develop products that will do just that we also have to be aware of the trade offs that can come with it. In the pump world it means making pumps that can achieve the highest efficiency and use less power to drive them. An example would be a water pump running 24 hours a day in a cooling system at a plant. The difference in the cost of electric power consumed by a pump that is 50% efficient versus one that is 75% efficient could be huge and over time the more efficient pump pays for itself in the energy saved. This would be great if we only pumped clear water all the time. In the real world we are confronted with many pumping challenges. The liquids may contain solids, which can be heavy or viscous, stringy, abrasive and may even need to be chopped or agitated in order to flow properly. 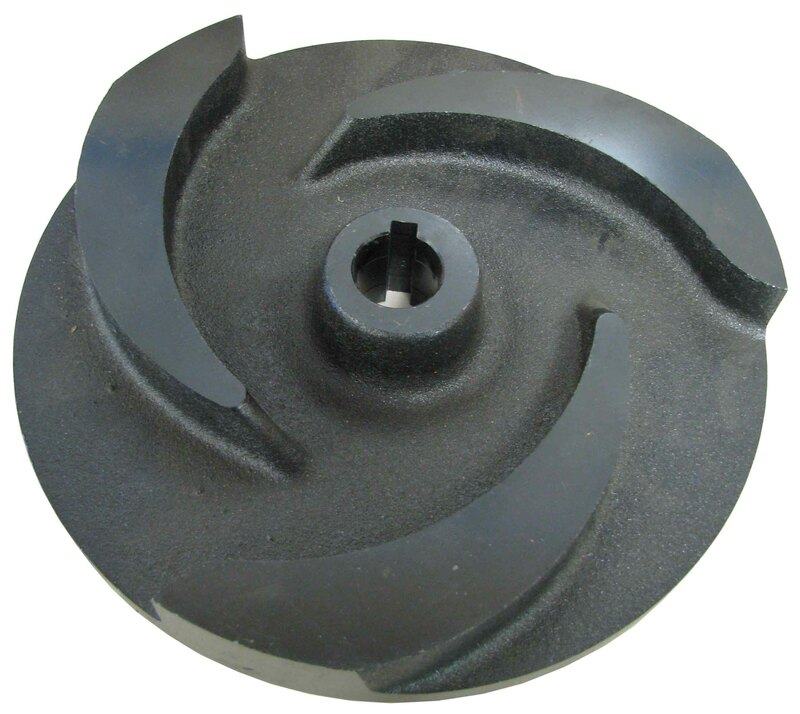 What good is a high efficiency water pump when it becomes clogged with solids and stops pumping? This is why there are so many different types of pumps designed for specific tasks. While pump manufacturers always want to build pumps that are efficient, making sure the pump does the job is the first priority. When that tank full of waste material has to be moved or that lake needs to be dredged or that sewer needs to be by-passed while repairs take place, using pumps that are practical for the job become more important than the efficiency of the pump.